The resources for military families who PCS have grown leaps and bounds over the last decade. Gone are the days of driving around neighborhoods looking for “For Rent” signs in the yard. 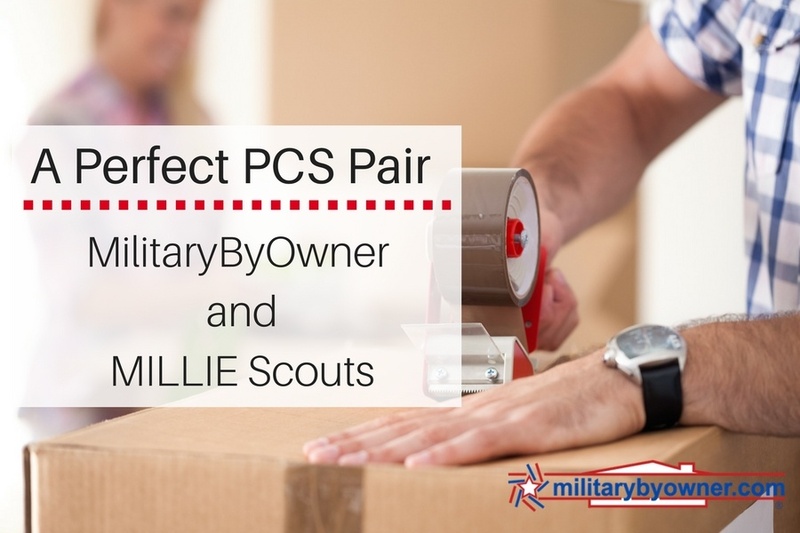 Two of the companies leading the way to stress free relocations are, of course, MilitaryByOwner, but also a relatively new, but completely necessary, service provided by MILLIE and their genius Scout program. Both MilitaryByOwner and MILLIE were conceived by veterans and milspouses who understood the hurdles we all face when relocating to the unknown. MilitaryByOwner has made home selling, buying, and renting so much more accessible and streamlined than ever before. Our site also features resources related to all things real estate and military life, from featured Homes of the Week to step-by-step instructions on how to vacation on the cheap. Home advertising that supports sellers, buyers, and renters. Dedicated customer service to ensure quality listings. Daily blog and resource articles covering a multitude of topics from real estate to military life. Local business directory including competent real estate professionals. MILLIE brings to the table an entire staff of military spouses who are, as Director of Community Relations Amy Shick calls them, “boots on the ground.” MILLIE’s Scout program fills the gap between house hunters and the distance between their new duty station. Often, military families find the perfect house online with pictures that appear to check all the wants and needs on the wish list. But when they arrive, the whole picture is revealed. Unkempt adjacent lawns, heavy traffic, and a local convenience store hangout could all easily be your new neighbors. Hiring a Scout to conduct research up front will negate a big chunk of those worries. The Scout can head to the potential address, attend a walk-through and show live video via Facetime. Because the Scout only works for the client, the observations are made entirely to provide the client with the best objective information possible. MILLIE Scouts are military spouses with years of PCS experience. They instinctively know to look for the large and small issues that make or break a successful home search experience. Rental Property Drive By and/or Checkup. With two businesses dedicated to the well-being of military families and their moves, there really isn’t reason to be overly concerned or intimidated by the upcoming PCS season. MilitarybyOwner and MILLIE have your bases covered, quite literally, and exist to serve the most deserving clientele. Take advantage of these resources, because there’s an abundance of knowledge and free spot-on advice to share!